The best thing that can define the dawn of 21st century science is the discovery of graphene. Graphene is a material that possesses a myriad of amazing properties that can be utilized in over a dozen fields of science and technology. Graphene is a one atom thick sheet of carbon atoms, each interconnected with three strong atomic bonds. The resulting hexagonal structure resembles a honeycombed chicken wire. Being one-atom thick, graphene is just around 0.33 nanometers tall, that's around one million times thinner than a strand of hair. Despite its thickness, graphene is the strongest material found on Earth. Diamonds are also made up of carbon atoms, each interconnected with four strong atomic bonds. But unlike diamonds, graphene is not rare. Graphene comes from graphite, the material used for pencil lead. Graphite is actually layers of graphene that are connected together with a weak atomic bond. In fact, Andre Geim and Kostya Novoselov, first isolated Graphene by using ordinary masking tape to peel off a layer of graphene from graphite. This can be done because of the weak bond connecting the graphene layers together. 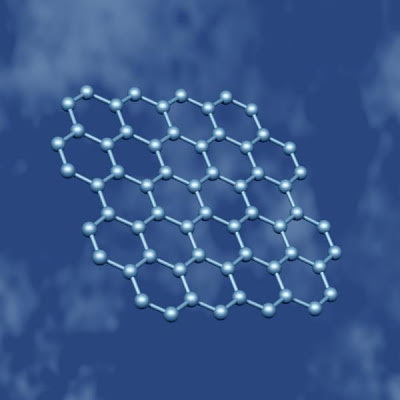 By constantly stripping away at the peeled off graphite, they managed to extract a single atom layer of graphene. Because of their discovery, they were awarded the Nobel Prize in 2010. Graphene can be used in many practical applications. Graphene is a great conductor of electricity. Electrons passes through graphene at almost the speed of light. Graphene is conducts heat efficiently. Its high thermal conductivity can be used to dissipate heat efficiently in electronic devices. Graphene is harder than a diamond and 300 times harder than steel. This property can be utilized in developing composite materials that can be used in a wide range of applications like construction. 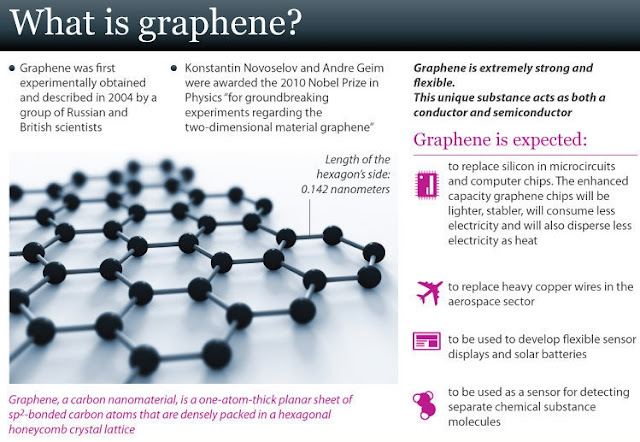 Writing in Nature, Nobel Prize-winner Professor Kostya Novoselov and an international team of authors has produced a 'Graphene Roadmap' which for the first time sets out what the world's thinnest, strongest and most conductive material can truly achieve. One key area is touchscreen devices, such as Apple's iPad, which use indium tin oxide. Graphene's outstanding mechanical flexibility and chemical durability are far superior. Graphene touchscreen devices would prove far more long-lasting and would open a way for flexible devices. Rollable e-paper is another application which should be available as a prototype by 2015 – graphene's flexibility proving ideal for fold-up electronic sheets which could revolutionise electronics. Liquid phase and thermal exfoliation – exposing graphite to a solvent which splits it into individual flakes of graphene. This method is ideal for energy applications (batteries and supercapacitors) as well as graphene paints and inks for products such as printed electronics, smart windows and electromagnetic shielding. Adding additional functionality to composite materials (extra strength, conductivity, moisture barrier) is another area such graphene can be applied. Chemical Vapour Deposition – growing graphene films on copper foils, for use in flexible and transparent electronics applications and photonics, among others. Synthesis on Silicon Carbide – growing graphene on either the silicon or carbon faces of this material commonly used for high power electronics. This can result in very high quality graphene with excellently-formed crystals, perfect for high-frequency transistors. Professor Novoselov said: "Graphene has a potential to revolutionise many aspects of our lives simultaneously. Some applications might appear within a few years already and some still require years of hard work. "Different applications require different grades of graphene and those which use the lowest grade will be the first to appear, probably as soon as in a few years. Those which require the highest quality may well take decades. "Because the developments in the last few years were truly explosive, graphene's prospects continue to rapidly improve. "Graphene is a unique crystal in a sense that it has singlehandedly usurped quite a number of superior properties: from mechanical to electronic. This suggests that its full power will only be realised in novel applications, which are designed specifically with this material in mind, rather than when it is called to substitute other materials in existing applications. "One thing is certain – scientists and engineers will continue looking into prospects offered by graphene and, along the way, many more ideas for new applications are likely to emerge." His co-author Professor Volodya Falko, from Lancaster University, said: "By our paper, we aim to raise awareness of engineers, innovators, and entrepreneurs to the enormous potential of graphene to improve the existing technologies and to generate new products. "To mention, in some countries, including Korea, Poland and the UK national funding agencies already run multi-million engineering-led research programmes aiming at commercialisation of graphene at a large scale."